This is the second edition in the Monthly Traffic and Income Report Series that I started last month. You can ready my July 2012 Traffic and Income Report here. August was not good traffic wise for Bloggers Passion but earnings for Bloggers Passion had not gone down. I noticed some improvement in engagement metrics through. 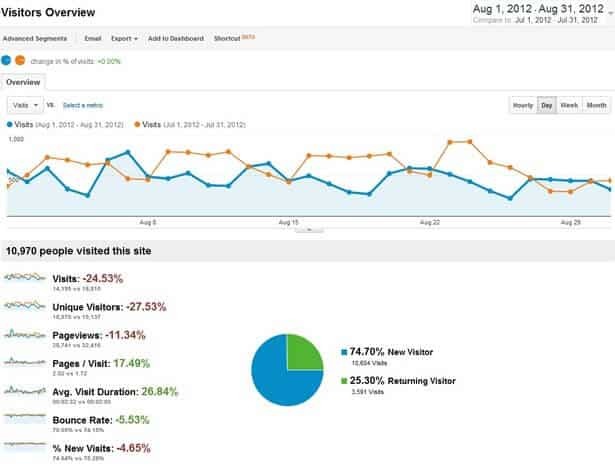 Keep reading this post to know more in detail about my traffic and income report for August 2012. Overall traffic on Bloggers Passion dropped by 24% thanks to Google Panda and Penguin in August month compared with July month traffic. Total page view reduced by 11%, but I see some positive in bounce rate, page views per visit and average time spent. Page view per visit improved from 1.72 to 2.02 in August month. Bounce rate improved from 74% to 70%. And average visit duration increased from 00.02.00 to 00.02020 in August 2012. I’m thinking of improving direct visits and referral visits on my blog as I’m finding it very difficult to make Google and its bots happy. No doubt overall traffic on Bloggers Passion has reduced but I’m happy with the progress I made in improving the engagement metrics especially bounce rate for my blog. I have made the habit of replying to most of comments that I get on blog posts on Bloggers Passion. But I’m facing a problem as lots of guest bloggers are not replying to incoming comments on their guest posts on Bloggers Passion. About some guest topics, I myself don’t have much knowledge, so I don’t want to comment anything on them. I think I have to become stricter about guest blogging guidelines. I’m going to edit my guest blogging guidelines and will make it compulsory for guest bloggers to reply to comments on their guest posts. Failing to this will result in removal of their links and even their whole guest post from my blog. What you suggest how should I go about solving this problem? In August 2012, 59% of total traffic coming from search engines, 21% traffic coming from referral websites and rest of 20% is coming from direct traffic. Top Referral websites in August month were StumbleUpon.com, Facebook.com, BloggingPro.com, BasicBlogTips.com and ZacJohnson.com. In August month, only 23 blog posts were posted on Bloggers Passion. 12 blog posts were written by me and rest of 11 blog posts were contributed by guest bloggers. It may have also contributed negatively towards my blog traffic. I’m aiming at improving the content frequency on Bloggers Passion blog in September month. I’m hoping I will be able to publish 35 blog posts in total on Bloggers Passion in September month. In August month as well, I did three guest posts like July month. They were published on BasicBlogTips.com, BloggingTips.com and WeBlogBetter.com. Disclosure: Some of links mentioned in this section will be my affiliate links. I will be earnings some revenue if you go on purchasing a product through my affiliate link. Expenses for August 2012 includes office rent and bit of low end social bookmarking work I get done from others. Again, you can see most of my earnings are coming from affiliate product selling and doing reviews kind of things. I’m no more relying on Google Adsense Earnings and thus removed Google Adsense widget from my blog sidebar. How I Made $16,433 While Selling a Single Web Hosting Affiliate Product? In the coming days I will be promoting my guest blogging services and review request section more to develop more money making opportunities. I will be making the habit of contributing more guest posts on other blogs in the blogging niche to gain more visitors on Bloggers Passion. I will aim at doing 5-6 guest posts at least every month, by now I was doing just 3 guest posts in a month. I’m soon also starting the newsletter series for Bloggers Passion readers. Thanks for this value and encouraging post. these types of posts help newbies like me to do more hard work. Going to share it with my friends. Keep up the good work. Hi, nice to see your report appreciate for this however i am too late to commenting on this post, but i want to clear one thing from you that hostgator and blue-host really paid such an amazing amount. As i heard so many thinks from some good marketers that if you make 50 sales a month they will pay you for only 25 is it true???? Great going Anil. Although, the traffic of the site has been reduced a bit as compared to the previous month but you have managed to earn a lot from HostGator affiliate program. Wish you success buddy. That’s true. Most of my earnings are coming from affiliate product promotions. You’re dong pretty much fine here man. Some people worked much more than this but got no result. Wish you more success. Thanks a lot Sheyi for liking and commenting on my monthly traffic and income report. Lets see Dean, how I will be doing earnings and traffic wise in September month. How are things moving on your blog? It will be great if both of us can make good amount of money from our blogging efforts. Gr8 to see the report Anil. I am new to blogging and launched my website in June this year. My blog’s traffic and alexa rank increased drastically as I was able to attract 15K unique visitors in the month of August and alexa rank came below 300K. In current month also my blog is getting good response with above 7K traffic in just 10 days, but earnings are too low as I am relying mostly on Google adsence. Not able to find good affiliate programme which will suit my website. Can you please suggest some or write an article on Indian affiliate programmes available. You are progressing well traffic wise with your job blog, Vijay. Would you be interested in sharing the amount you are able to using Google through the traffic you shared. Apart from Google Adsense, you can try sellling banner advertisements, look out for CPM based offers and find some products matching your blog niche. You can try selling some targeted books from Amazon etc. I will see if I can create a post that Indian bloggers can use to make money through online blogs in the coming days. Thanks for your prompt reply and valuable suggestions. Last Month I earned $30 and this month its $14 till date. Good ! Keep it up dude. I always checked your reports to know how and what ways to keep blogging as profession. Great to know you are liking my monthly income and traffic report series. Wow superbly inspiring report. Are you planning on employing me? Keep it up mate. One day I will also reach this point! Good to know. Surely you will be able to make more than what I’m able to make today very soon. But you need to work really hard and need to work towards making your blog design attractive.